Chair Qi is done sitting standing and is a combination of MIndfulness ,Tai Chi and Qi Gong postures . After a week in Slovakia teaching Qi Gong and several one to one healing sessions .I had a theme which continually comes up in energy work once ..when a persons energy is grounded they immediately start to heal,.My work is not to heal anyone but assist them in opening there energy to the Earth firstly .Sometimes skill is needed to sense this and assist in opening certain parts of the body energy system but many people simply are not grounded ,its very easy to ground and only takes a few minutes .I teach it at the start of every class one to one or workshop ..
Qi Gong Tai Chi Exercises Meditations and to gather together in Community to nourish each other in a healthy way . Old Monastery Building as you enter the grounds go towards the back of the building go to the blue doors. The workshop will include Tea /Coffee and all meals .A walk around the grounds along with some early and mid morning exercises and Meditation . Hi i am keeping a day free for keeping still in normal time and after Meditation. There are great benefits to Qi Gong and Tai chi along with many other interesting practices .The main problem we have in the West is we start chattering and get carried away with thoughts again with others or on our own . I know it certainly is not easy to be less distracted by your thoughts me included .I feel if we could master this part many of our health and life problems would simply dissapear . So if u want to learn something teach it so i heard .I will guide some deep Meditations and the second part will be unguided along with time in Nature and Quite time during Lunch for 20 min sessions roughly and at the end of day we will be a step closer to bringing this into our daily lives . Saturday the 2nd of March lots of seated Meditation and stillness some Meditation experience or Qi Gong training is required for this day . Hi from Amber center . We will be looking at letting go old patterns and stepping into Spring with renewal course will deepen weekly and help u in healing or recovering from old Trauma . Medicine walk ,Meditation,stretching ,breathing ,connecting with the elements . Combined with a bit of social time to be in community together . Sat 26th Medical Qi Gong is going ahead few spaces left . Also reminder Thursday evenings going ahead Oranmore ..
Starts 10.00 am finish 4 Lunch provided . These exercises can help u get back on your path and empower u in new directions in your daily life or heal old wounds . Hi all just a short update on classes . There is a new class starting in respond Oranmore Qi Gong meditation /Tai Chi . 7 pm starts Thursday 15th Nov drop in available . Mental health /Qi Gong Workshop. I will run one workshop on this in Oranmore during Month of Nov date and venue to be announced . It can also be part of our Instructor training . embark on a journey of self discovery and meditation to open up yourself to the abilities of healing within each of us ..
Work with the five Elements heal your organs and train Meridian Qi Gong . Opening the 3 Dantiens and Qi Gong stretching of Tendons 8 Silk Brocade along with ceremony of the Elements . Thank you for this intensive, empowering weekend. I came to new realizations, gained great power for the days to come. Amber healing center is a charming place with great energy. I loved the way qi gong and meditative practices were combined at the center as well as in the nearby nature. Colin, thank you for this healing weekend. A real treat for the body and soul. Relax with Qi Gong Exercises meditation and Taoist Basics during the morning .In the afternoon we will explore local Nature and outdoor methods of connection Iand Garden .These day can help u get back on your path and empower u in new directions in your daily life or heal old wounds . ‘Thank you so much for a thoughtful and well structured course. I not only learned a lot about the various therapist training and healing but about myself as well. We covered a wealth of material which I’m sure will be sinking in for a long time yet. It was a perfect mix of fun and learning with plenty of yummy food, copious cups of tea and excellent banter. It was invaluable to learn in such a supported and encouraging environment and I know we will all come away with a lot out of it. Hi there here is a little clip from our current instructor training course https.This group been training Monthly since October 2017 and putting in some time on case studies .Mostly working on personal stuff for year 1 .We are planning a course for September later this year combining acupuncture with our current instructor training ,I will be sharing the training with INMI teacher Anthony Monteith ..
10.00 am – 4.00 pm ,Amber Healing Center,Ballindereen, Co. Galway..
chi martial or soft “health” styles taught today. body and within the earth to deepen the practice. Once learned can be practiced daily for maintenance and wellness. Some guided meditation will also be part of the day . Hi Guys welcome to our first podcast we will be covering many topics in the coming Months look forward to your feedback ,this one covers when i first became interested in the practice of Qi Gong.. It was great to be part of the launch of healthy in Claregalway Yesterday . I was never in there before but its a really cosy space .The event was well organized with yummy food and snacks and catered for all ages ,Community groups and public in general.Its good to see the Council getting involved in supporting the community in the mental and physical health areas. I was never in there before but its a really cosy space .The event was well organized with yummy food and snacks and catered for all ages ,Community groups and public in general.Its good to see the Council getting involved in supporting the community in the mental and physical health areas. Follow along these basic movements ,detail is in the Ankle movement and the wrist hand tension as u turn opening the chest muscle after you turn the hip and spine.In relation to the essence of Tai chi this demonstrates 5 basic essence up dpown /left right .along with gripping techniques / Cai . Happy new year from the Amber Center been a wet and wild start lets hope it picks up soon. Jan 9th 8pm Qi Gong and meditation. This day will be a great opportunity to get u going after the holidays and reconnect to your flow for 2018.
book in advance minimum 3days . Hi all felt i would add something about these training methods .I have been training Qi Gong now for over 20 years and Tai chi for at least 12 .The results are im healthy firstly .This does not mean i dont experience stress ,fear anxiety but i do feel it has less impact and i recognize it much faster now and can change it before i feel bogged down . In recent years i have incorporated more Tai Chi into my workout as i found personally there wasnt quite enough movement in Qi Gong .Tai Chi has been marketed worldwide as a practice that must be done slow .This is not really true it has to be learned slowly as it goes into subconscious memory faster this way .It also has many cardio breathing exercises /Fa jin . Tai Chi has one of the best movement systems or as good as many worldwide .when i first met Tai Chi i lived in London as a carpenter .I was at 8 to 9 years of Ninjitsu at this time .I spoke with my Teacher Shi De Lon about internal external ,so i committed myself to 3 Months of Tai Chi .I have to be honest i was absolutely lost at first .Only when my teacher explained some of the martial applications did it begin to make some sense.The interesting thing was when i returned to Ninjitsu practice i found some of the more technical aspects like the senior students could do much more easy to grasp my body had new cogs and intelligence from this slow learning . Im not comparing the Arts but it should theoretically improve any athletes movement Co ordination foot adjustment being one of the first steps and leg hip movement.we usually move our arms first this takes about 300 muscles .If u move leg first u need many more muscles this opens up new neural pathways in body . more coming soon fell free to comment .enjoy. Some nice Qi in the corcomroe abbey yesterday i often find these places fill me up with energy much faster than home practice ,During our weekend breaks we get out to these local places and do little qi gong/Tai chi or Meditative practices along with coffee pit stops and sightseeing in Burren. During a morning practice i had an insight about retreats or workshops of this type of thing we sharing.During Qi Gong healing work i am encountering young and old people who feel something is missing or are uncertain about direction anxious etc ,Why would u go for healing if everything is fine right or u may just not want to find out right now . Anyway the insight was there kind of floating in my thoughts that many years ago people lived in a tribal community and even up to recent years community in Ireland was much closer .I do remember as a child going to neighbours house for sugar or Milk.Somehow many of us have lost This and along with a sense of Community and connection. In a tribal community there was always an ear to listen and if a relative died or trauma happened there was still group support for a child or adult along with the wisdom the tribe had gathered over the years .There were annual and monthy rituals and keepers of wisdom within each community. We often see this in the animal kingdom where the adult teaches the next generation the movements of survival and thriving before they are let into the world alone. If the adult had not the knowledge the youngster may end up in trouble very soon or learn the hard way .In energy work we learn things are not always as they seem and with connection and trust there is a dynamic way to move through any situation along with good group of wise people family friends etc. 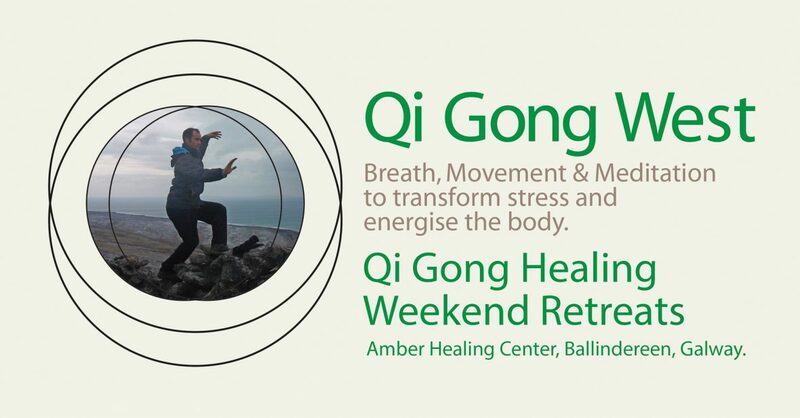 In a Qi Gong weekend retreat people get the chance to be themselves and relax in a supportive community if only for a weekend and learn to open and trust that wisdom. Hi all hope u well and getting into the Summer in good spirits . Have a few new classes starting for June and early July before Summer break . Would need to have done the original workshop to attend. We will run through movements and go deeper into the meditative aspect of the form. The original 800 year old lineage form of Chang San Feng, the 13th century founder of Tai Chi. This 15 minute form is easy to learn, yet uniquely powerful. The style of Yoga is flow Yoga and leaves the body with a very energized feeling. I know a few of you were looking forward to this event . It has been postponed to 8th of July I really feel this will be a good event get in touch if interested .This location holds a strong energy flow good place for us all to capture the Earths summer rhythms and get deep healing . 1.00 – 4.30 visit local Stone Circle and Dolmen and practice Qi Gong. Learn this ceremonial Qi Gong form for self healing. Bring some warm Comfortable Clothing and outdoor gear /packed lunch . Tea and snacks provided at Heritage center for morning session. The moment i drove past the crossroads on entrance to Lough Gur my feet and body started tingling with energy as if i was meeting good old friends after a long time apart a feeling of inner joy easiest way to describe it after many years of Qi Gong i have become quite sensitive to these energy flows .There is great access to Earth Energy in these Sacred places and even a beginner can feel the benefits ,there are at Least 2 stone circles on the land and some Dolmens on way in to Heritage center .My belief is we can get alot of healing even in a short time in these places if we can access the energy flowing there through our bodies. There will be a one day event in May and June visiting the Sacred Site and training of Qi Gong in Lough Gur Heritage Center for the morning ,Qi Gong,walks and energy practice in the Stone circle in afternoon . Shi Xing Lin will be here at Amber center in April 7 -9th along with other members of the Shaolin training community so there will be at least 3 teachers to train and learn new things from .It looks to be a fun event with lots of Tai chi/Qi Gong good food, fires and laughs ,book soon if u plan on coming as spaces are limited and just a few left . Saturday 14th January Day workshop Amber Center . An early morning of meditation,connection to Nature and Qi Gong. for those who like a cuppa 10.00 am. Classes Amber Center Qi Gong daily practice routine and meditation. A morning of Basic Qi Gong and meditation and posture.